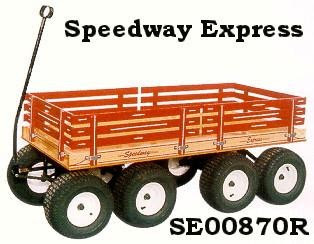 The classic wooden Little Red Wagon, Speedway Express Wagons remain one of our most versatile and popular products. These wagons are perfect whether you need a wagon for the kids to play with, or a wagon to haul the kids in at the beach or fair, or just a handy wagon around the yard. 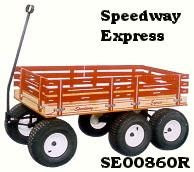 Speedway Express Wagons come in models of varying sizes, so you can find the one that suits your needs. They also come in red, blue, two types of green, and even pink! For heavy duty and beach hauling, there are even tandem wagons with six and even eight wheels. Need extra traction for your beach visits? Here it is! Extra traction for the slippery sand! 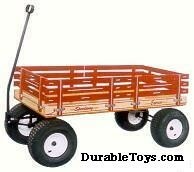 If you need something with extra fore and rear traction, we also carry an eight-wheel tandem wagon. Don't forget to check out the accessories too!